Eternal guardians with hooves and horn. Is it Belharza or the Empire that you mourn?" Minotaurs, also called man-bulls or bull-men, are a species of beastfolk with the body of a man and the head of a bull. During the First Era, they were said to have symbolized the Alessian Empire, but in later eras became more commonly perceived as savage monsters by the people of Tamriel. They have thick grey or sometimes brown skin and large curved horns. Some Minotaurs clothe themselves in a simple loincloth and shawl or wear nose-rings. Others wear intricate leather armor, and some prefer to be completely naked. They are most commonly found in the Colovian Highlands, Great Forest and the Gold Coast regions. 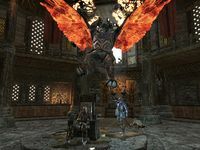 Although no records survive to confirm their origins, some scholars claim that Minotaurs trace their lineage back to the relationship between Empress Alessia and Morihaus. Their union gave birth to Belharza the Man-Bull, believed to be one of the first Minotaurs, who ruled the Empire after the death of Alessia. Conversely, other scholars dismiss such theories as both lightly heretical and having no basis in historical fact. Regardless, in the years during and after Empress Alessia's reign, Minotaurs began to appear in greater and greater numbers. During this time, it's believed the early Minotaurs possessed intelligence and culture comparable to other races of beastfolk. Artwork and texts from the First Era suggest they were fiercely loyal to the Empire and were among Empress Alessia's most devoted defenders. Despite their devotion to the Empire, Minotaurs were always a target of suspicion and fear because of their size and strength. With the rise of the fanatical Alessian Order, they were re-classified as 'monsters' no better than ogres or trolls and were driven into the forests, destroying whatever culture they previously possessed. Much of the evidence to support this claim was also destroyed in the intervening period while the Alessian Order ruled the Empire. One remaining fragment of an ancient tablet depicts Alessian troops revolting against Emperor Belharza, giving some credence to the theory. Minotaurs were not entirely wiped out by the Alessians, and continue to roam the backwoods and hills of Cyrodiil throughout the following eras. By the Third Era, their noble ancestry was all but forgotten when some of them were rounded up and used as opponents for arena matches in the Imperial City. Although excessively male as a species, female minotaurs do exist. Minotaurs are social creatures, and often appear in groups numbering twenty or more. The largest male dominates this clan structure and has breeding rights with all females of reproductive age. Younger males will often challenge this dominant male in a fight to the death. Minotaurs are notoriously strong and difficult opponents in combat, despite their false reputation as clumsy brutes. They are resistant to magic, can easily swing heavy weapons with one hand and their horns have the ability to tear through the toughest armor. The most powerful individuals are referred to as "Minotaur Lords". They are believed to possess only rudimentary intelligence, but have a heightened sense of smell and can track a man by scent alone. Although Minotaurs commonly fight with weapons, Minotaur shamans have the ability to use magic. Minotaurs also served as the protectors of the unicorn at Harcane Grove, which was killed in 3E 433 for the glory of Hircine. One common observation of Minotaurs in the wild is that they tend to congregate around ancient ruins that were of significance to the Alessian Empire. Some believe they are drawn to guard these places on an instinctual level, possibly due to their ancestral connection to Morihaus, Belharza, or the Empire itself. Minotaurs share little civil interaction with humans or elves, but are typically free to settle around the ruins they inhabit. They mostly keep to themselves when unprovoked, but are also very territorial and will react aggressively on intruding adventurers. As a result, most inhabitants of Cyrodiil stick to well traveled roads to avoid contact with such creatures. Hearsay surrounding Minotaurs includes apples being poisonous to them, which results in travelers eating several before a journey. Others examples characterize them as "cruel man-eaters", and they are sometimes used to scare children in tales and song. Conversely, some children's toys are made to resemble Minotaurs. Their severed heads are sometimes exported to other provinces, possibly to create wall-mounted decorations that were quite common in homes throughout Cyrodill. Minotaur meat was often used in the mid-Second Era to make slumgullion stew.. Oxblood fungal spores are known to grow on Minotaur, and are used by some blacksmiths in their work. Their horns are often displayed as prestigious hunting prizes or crafted into ornate warhorns and hunting horns. Their horns are also valued by alchemists for their various alchemical properties. Some blacksmiths honor the Minotaurs by creating armor and weapons inspired by their characteristics, such as the use of horns in its design or Imperial iconography - appropriate for a race so deeply linked to the early history of Cyrodiil. 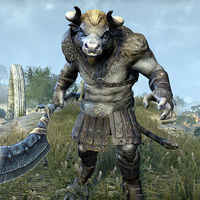 Domihaus the Bloody-Horned was a colossal Minotaur warlord who allied with the Dreadhorn Clan in 2E 583 and attempted to take Falkreath. Galrus Grimhorn was a Minotaur that became a champion of the Hammerdeath Arena in High Rock some time before 2E 583. Limenauruus was a colossal Minotaur encountered by the Dragonstar Caravan Company in 2E 583. He was discovered underground in the ruins of Fort Faleria, where Lord Nunex Faleria had enslaved and killed a large number of his kin centuries earlier. This page was last modified on 8 February 2019, at 21:29.